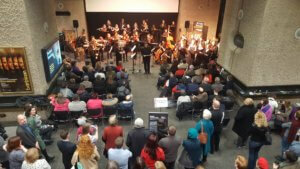 On 2 December, Britten Sinfonia Academy gave a Christmas performance in the Barbican’s foyer. For some of the performers, it was their first experience of working with a choir and a soloist. Baritone Ben Davies, along with a choir of professional singers joined the orchestra for rehearsals, sharing their wisdom and helping the young musicians craft a wonderful performance. We spoke to some of the Academy’s young musicians to find out what they thought of the experience. The fact that we don’t have a conductor makes BSA rehearsals very different to most. Everyone has to be much more aware of the different parts of the orchestra, and more involved in shaping the whole piece, not just their own line, which makes the rehearsals very intense, but also satisfying, as it makes us feel more deeply part of the performance. We always get to work alongside really inspiring professional musicians, which is so exciting; on this course we worked for the first time with singers. The singers only joined us on the day, which was challenging, as we had to try and polish the Vaughan Williams with such a large part missing, and then adjust the balance on the morning of the concert. The concert was extremely enjoyable; I felt it went well and it is always such an exciting experience to play at the Barbican! The baritone soloist had a really lovely voice and sung very thoughtfully, so he managed to create a really magical atmosphere at the beginning of the beautiful Vaughan Williams, which it was really special to be a part of. The rehearsals were a very unique experience. The way all of us imputed our own ideas to make the piece our own was something I had never experienced before. 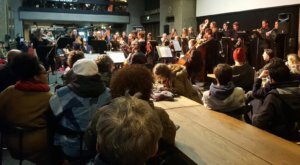 It was great to see the number of people who were drawn into our playing in the Barbican foyer and working with the choir made us all work together in a way I never had before in any orchestra. While this wasn’t my first concert with BSA in the Barbican Foyer space, it was my first time with BSA and voices. Blending with the voices presented a whole new set of challenges I hadn’t had to face in an ensemble scenario before. The rehearsals with both Ali and Ben leading proved remarkably interesting in broadening my understanding of the repertoire, the associated traditions of choral works and ballet suites respectively, and ultimately we ended up pulling off a really polished and enjoyable performance! To get Christmas started Britten Sinfonia Academy gave a festive performance at the Barbican to complement Britten Sinfonia’s evening concert with the choir of King’s College, Cambridge. Shadowing the work of their older mentors the Academy focused on working with singers, and together with a choir and baritone soloist they performed Vaughan Williams’ Fantasia on Christmas Carols. It was a wonderful day – the Academy played brilliantly to a large audience in the foyer, and alongside some virtuosic movements of the Nutcracker everyone felt the Christmas cheer! Well done BSA! We are now accepting applications from secondary school aged musicians to join Britten Sinfonia Academy 2018-19. If you’d like the opportunity to work with professional musicians while developing your own musicianship, BSA may be right for you. Find out more. We are also accepting applications to Britten Sinfonia Academy Composer Hub, find out more here.